Unleash your inner artist with this deluxe sketchbook featuring creature art from Fantastic Beasts and Where to Find Them. 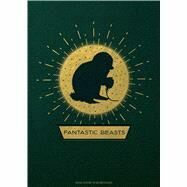 Fantastic Beasts and Where to Find Them introduced fans to a host of exciting new magical creatures from the wizarding world, imagined and brought to life onscreen by the talented artists working on the films. Now fans can design their own fantastic creations with this deluxe sketchbook, featuring exciting concept art of Nifflers, Thunderbirds, Erumpents, and other creatures from the movies as inspiration. With sturdy construction and sewn binding, this sketchbook lies flat, and the 192 blank, acid-free pages of high-quality heavy stock paper take both pen and pencil nicely to invite a flow of inspiration. Includes a ribbon placeholder, elastic closure, and 6.5 x 9.75–inch back pocket, perfect for holding photographs and mementos.